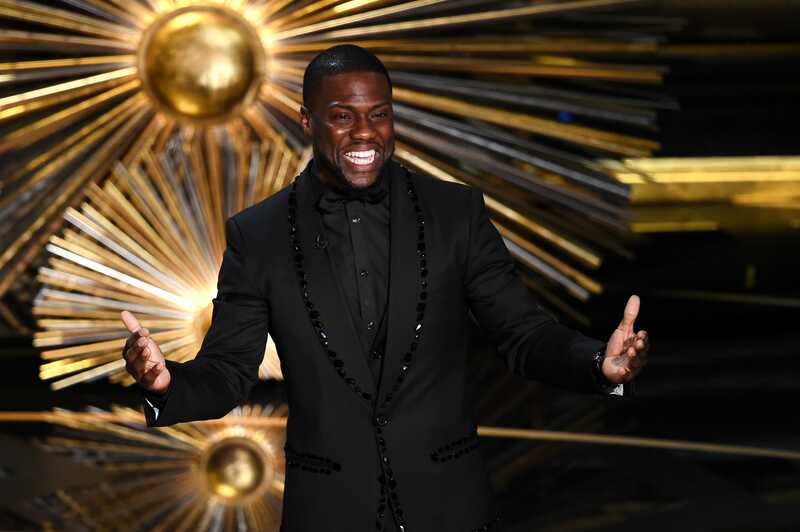 The Academy Awards are more polarizing than ever, after suffering their worst ratings in recorded history last year, and battling controversies ranging from #OscarsSoWhite, to the popular Oscar category, to the drama surrounding Kevin Hart. And that’s not just how the public feels. Some inside Hollywood believe the show is at a dire crossroads. Business Insider spoke to past Oscar show producers, Academy voters, and producers of other live TV shows to investigate what has gone wrong. The 91st Academy Awards air February 24 on ABC. Since 1929, the Academy Awards ceremony has been the biggest night in Hollywood. But do you really care anymore? 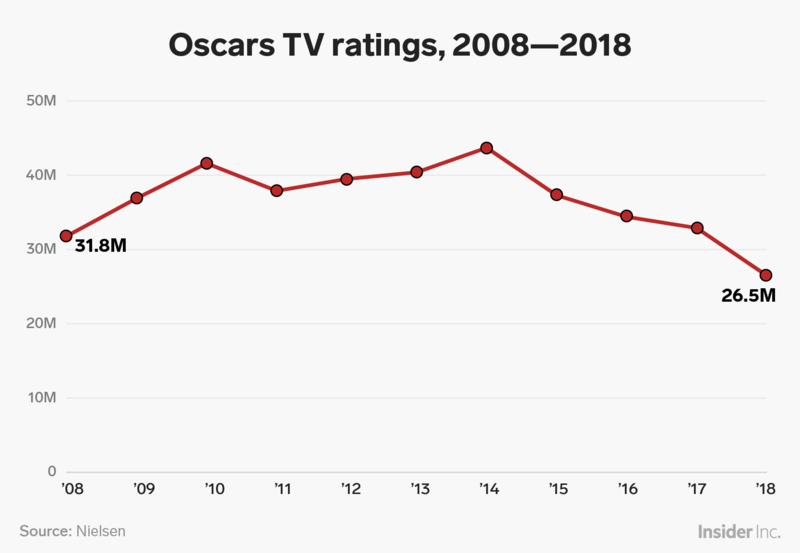 It feels like the Oscars are at a dire crossroads, from the telecast’s sagging ratings to its lack of diversity — which was pushed front-and-center by #OscarsSoWhite in 2015 — to this year’s hosting drama, and the stripping of categories from the live broadcast. But some within Hollywood believe their big night has been on life support for some time. Business Insider spoke to past Oscar show producers, Academy voters, and award show pundits to learn about the numerous attempts over the last two decades to make the Oscars telecast more modern. Despite these attempts, the show always seems to revert back to its more traditional form, and many in the industry think that’s a terrible trend. "The show needs to change," Bill Mechanic, an Oscar-nominated producer who resigned from the Academy of Motion Picture Arts and Sciences’ board of governors last year, told Business Insider. "But not in a way that it’s watered down in terms of its artistic measurement, in fact, that should be preserved." 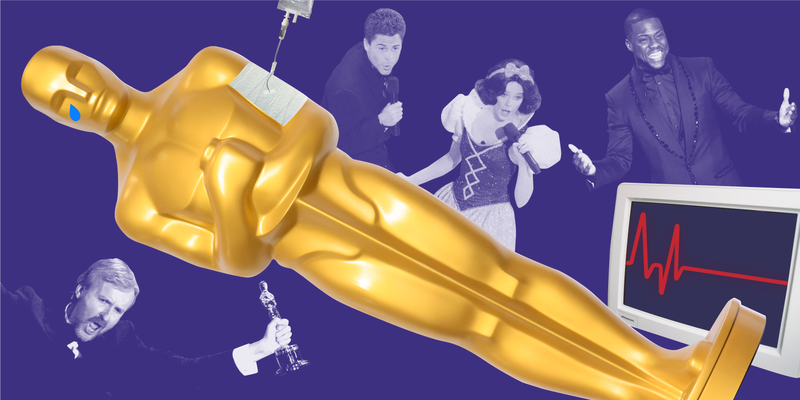 Here we investigate what has gone wrong with the Academy Awards and what needs to be fixed. The last time the Oscars didn’t have a host was in 1989, and that year will forever be known for having the worst opening in the show’s history: an 11 minute-plus musical number that followed Snow White as she navigated through different eras of Hollywood and all its glamour. It ended with her doing a duet with — wait for it — Rob Lowe. The backlash was immediate, including Disney suing the Academy for using the likeness of Snow White, and changed the course of the Oscar show forever. A review committee was formed to audit the show from top to bottom, leading to former DGA president Gil Cates producing the show the following year. He brought on Billy Crystal to host, which led to the Oscars’ golden years. 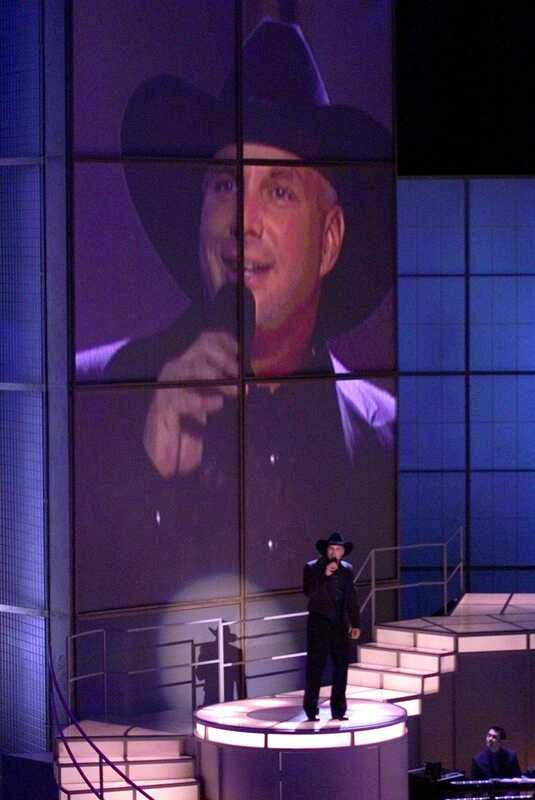 Gates, who died in 2011, produced the show a record 14 times, including the 70th Academy Awards in 1998 when "Titanic" won best picture, and the show was seen by over 57 million viewers, the most watched in history. APEverything surrounding the 2019 Oscars makes it feel like the show is facing another moment when change is needed. But it can’t seem to get out of its own way. Following the record-low ratings of last year’s show, the Academy’s attempt to rebound has been crippled by bad publicity. When word hit in August that a popular movie category at the Oscars was being considered, the outrage came from both the public and the industry. Then in early December Kevin Hart walked away from hosting this year’s show following an uproar over his past homophobic remarks, leaving the evening without a host. That was followed by a short-lived attempt to control the show’s run time by cutting out some of the performances from the best song nominees, and a new plan, announced Monday, to give out some technical awards during commercial breaks. The relegation of some awards to commercial breaks has angered many in Hollywood. "To be at the show and your award not to be worthy, I think it’s somewhat insulting," Lili Fini Zanuck, who produced the 72nd Oscars in 2000 with her husband Richard D. Zanuck (the two produced best picture winner "Driving Miss Daisy"), told Business Insider regarding the decision to not televise live all 24 award categories. This kind of erratic maneuvering by the Academy is exactly the reason Bill Mechanic resigned from its board of governors last year. And ideas to make the ceremony more appealing to watch are brought up every year, they usually just don’t stick. Several former Oscar show producers told Business Insider that suggestions for something like a popular Oscar category, or limiting the number of awards presented during the live telecast, aren’t new. They have been kicked around within the Academy for over a decade. But the fact that those ideas are now at the point of serious consideration shows the severity of the situation the telecast is in. Zanuck recalled the effort to make the show look modern in the year she and her husband were at the controls in 2000. APSo the Zanucks ditched the old Hollywood sets of previous Oscars and dressed the stage with 35-foot columns consisting of HD monitors stacked atop each other. Throughout the night, the screens would show clips from previous Oscar shows as the presenters took the stage. And instead of a live orchestra playing music through the show, the Zanucks had a pop music score. They also gave the viewers at home a deeper look inside the show by cutting to shots of what was going on backstage. The show, hosted by Crystal, took in close to 47 million viewers, a bump from the 46 million that watched it the year before when “Shakespeare in Love” shocked the world and won best picture over "Saving Private Ryan." In fact, it was the highest-rated show in this millennium. The Zanucks seemed to have updated the show in a way that still celebrated its history but was more engaging for viewers watching at home. But, outside of the brief shots of the backstage, many of the things done at the 72nd Oscars were not used again. “A lot of people in the Academy don’t want to change anything and I think they are wrong not from a purist standpoint but from an entertainment standpoint,” Mechanic said. Since the Academy is so resistant to change, the Oscars not having a host might be great for this year’s telecast, since it forces everyone involved to get out of their comfort zone. “If you book presenters properly and they are big enough stars, you don’t need a host,” said Jeff Margolis, who directed the Oscars telecast eight times, many of them in the show’s glory days alongside Cates. And Margolis knows a little something about doing the show without a host. 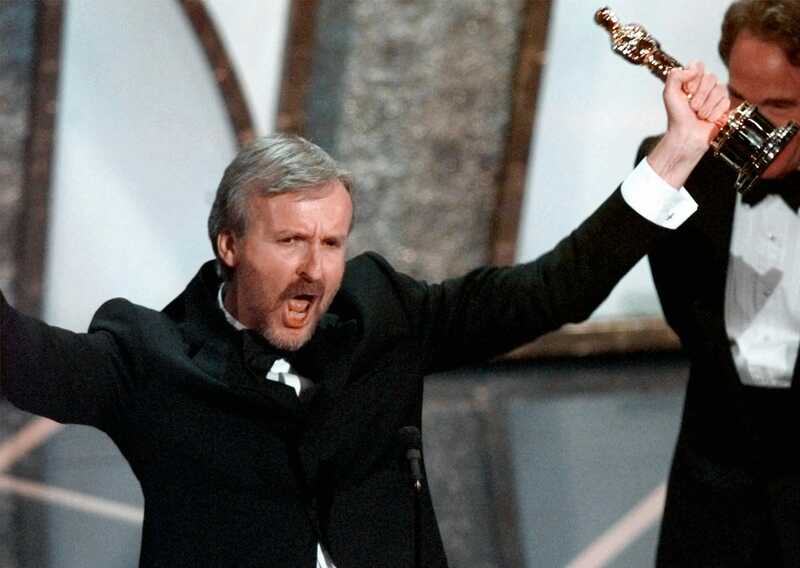 The first ever Oscars he directed was in 1989, the last time the show didn’t have one. Though that show was infamous because of the Snow White opening, Margolis believes what Allan Carr, that year’s producer, did right was booking interesting presenters. The show featured presenters ranging from hot “it” couples of the time (Don Johnson and Melanie Griffith) to legendary duos from the movies (“Vertigo” stars Jimmy Stewart and Kim Novak). Shankman, who produced the 82nd Oscars with Mechanic, pulled off the rare two-person-hosted show with Steve Martin and Alec Baldwin (the show was one of the highest-rated in the last decade). But his favorite moment didn’t involve the hosts. “My year we had Robert Downey Jr. and Tina Fey present original screenplay, and I could have watched them all night, they weren’t the hosts,” he said. APProducers who have done major live TV shows other than the Oscars agreed that the lack of a host isn’t a big deal. “People don’t like a host doing shtick anymore,” Ron Basile, a producer at AEG Ehrlich, the production company of veteran Grammys producer Kenneth Ehrlich, told Business Insider. And Ian Stewart — who has worked on everything from the 2012 Olympics opening ceremonies, to the Victoria’s Secret Fashion Show — believes in today’s world it’s less about finding the right host and more about crafting viral content that can spread on social media. Is it time to disrupt the bloated award season? With some changes coming to this year’s Oscars, and some of the biggest blockbusters of the year nominated for best picture (“Black Panther,” “Bohemian Rhapsody,” “A Star Is Born”), the telecast could be headed for a rebound year. 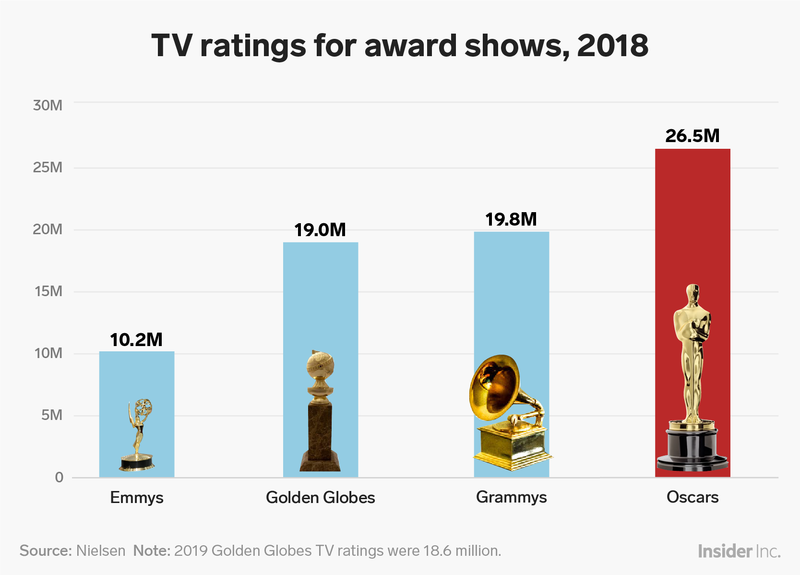 But even if the 91st Oscars are produced in a way that keeps viewers engaged, there’s still the issue of the time of year the ceremony takes place, which many believe is hurting the show. Since the start of the Oscars almost a century ago, many other award shows have sprung up around it. There are around 14 award ceremonies before the Oscars, from the ones televised (Golden Globes, Screen Actors Guild, Critics Choice Awards, Independent Spirit Awards) to the many more that aren’t (Gotham Awards, National Society of Film Critics Awards, Producers Guild, Directors Guild, Screenwriters Guild). And because of social media and the horse-race coverage of the Oscars lead-up, many are burnt out by the time the big night arrives. “I love movies, and I’m in the business, and I’m even tired of seeing Hollywood pat themselves on the back so many times,” one Academy voter said. Many in the Academy believe the Oscars need to happen earlier. The theory: to bring viewer intrigue back to the show, it should no longer be the final act of award season. “The cannibalization of the specialness of the evening is probably, in my opinion, been the single worst thing for the Oscars,” Shankman said. Yutong Yuan; Business Insider/NielsenAnd this isn’t just a recent issue. Shankman recalled how obsessed everyone on the team was about every aspect of all the award shows leading up to their Oscars in 2010, so they wouldn’t repeat anything that happened previously in an award show. In the dog-eat-dog world that is Hollywood, many feel the biggest dog needs to own the turf better. And it seems the Academy has finally caught on. In 2020, the Oscars will air on February 9, marking the earliest the show has ever been presented. But some think it should be in January. “The problem with doing that is voters will not have had enough of a chance to see the movies, and it would essentially be declaring war on all these other shows,” The Hollywood Reporter award columnist Scott Feinberg said. Some aren’t as compassionate about this potential dilemma to award season. When it comes to the Oscars, there’s no way to satisfy everyone. But despite all the negative reviews posted the following day, and complaints that go viral, that show is still a huge moneymaker for ABC, and the top TV event of the year besides the Super Bowl. The network, which in 2016 extended its contract to air the Oscars through 2028, has consistently raised the cost of the ad spots that run during the telecast. 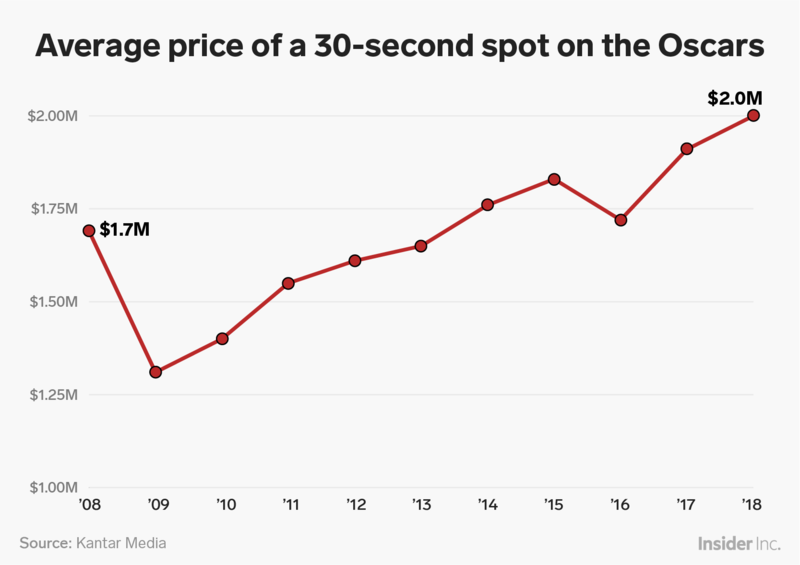 In 2017, it was $1.91 million per 30-second spot; last year, it was $2 million; and this year, $3 million. It’s a phenomenon that’s going on with all live "must-see" TV: ratings are sliding, but brands still believe it’s worth being there. “If you’re a sponsor and you’re trying to reach any kind of mass appeal, you sort of grab at the platforms that can still do that," CNN media critic Brian Lowry said. "The Oscars is in the same way that sports have an advantage, if you are really into the Oscars, you don’t want to DVR it and watch the next day. I wouldn’t be surprised to see Netflix, Amazon, or HBO ponying up for some ads during the Oscars because to launch your new spring shows it’s going to be one of the last big platforms to reach a lot of people." Yutong Yuan/Business InsiderBut ABC is now doing more than just selling ads. The network is through standing back and letting the Academy have full control of the show, which is how it had been for decades. One of the stipulations in the 2016 contract extension was that ABC now has more say in key creative aspects of the show. The choice of host and producer is now a discussion between ABC and the Academy (though the Academy has final say). This is why in the last two years you’ve seen a lot more ABC/Disney elements on the show, like Jimmy Kimmel hosting and using Disney titles in his stunts. Sources told Business Insider that for years ABC has wanted the show to only be three hours long, so coming off a year that had the worst ratings ever, it’s safe to say the network has more leverage than ever when it comes to run time. AP“This has to be said, nobody does this show to fail,” Shankman said. “Everybody goes in wanting desperately to do the best job that they can and to honor the evening and to honor the people that are involved. Even the years that have been lowest in the ratings, there have been wonderful parts of the show." But it is hard to balance all the forces at play: ratings, artistic integrity, tradition, freshness. Often what you end up with is a show that satisfies no one. The Academy of Motion Picture Arts and Sciences did not respond to Business Insider’s numerous requests to comment for this story.